Above, the famous zen dry garden at Ryoanji in Kyoto, Japan. Okay, so we don’t have green thumbs. That has been well established by our history of plant demises in three different yards in locations ranging from the subtropics to the arid West. Not to worry. Rock gardens are the next best option, and we’re hard-core rock gardeners. 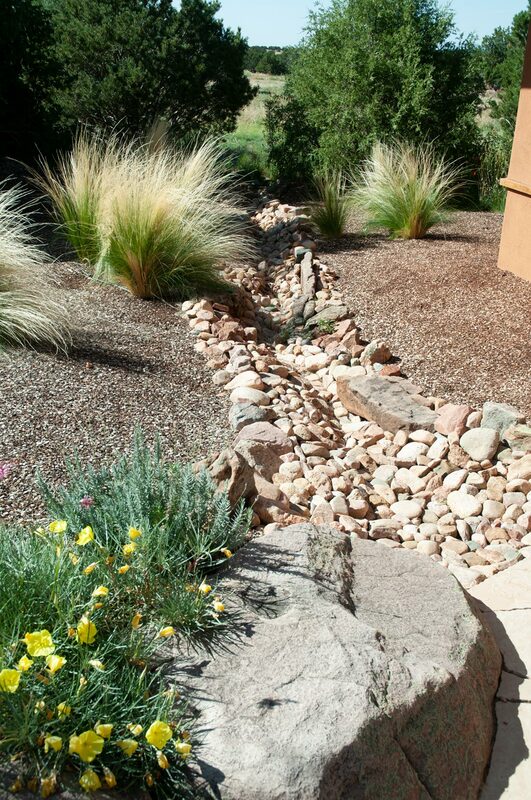 Dry stream beds, dry waterfalls and rock paths are a versatile option no matter what the size or climate of your yard. Interspersing plants with rocks can provide mini-landscapes that add interest, lower your water bill and survive the droughts that have become standard in many parts of the country. 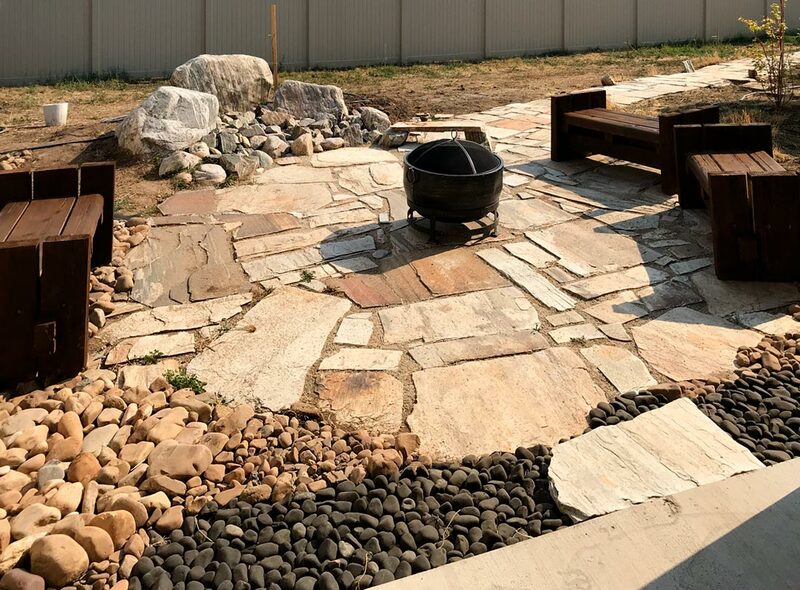 The patio in our back yard incorporates rock pavers, a dry water fall and dry streams in two different colors of pebbles. Rocks are not a renewable resource, but they are recyclable and widely available as a recycled material. We have acquired most of ours for free from people who were getting rid of them because their land originally had too many naturally or they wanted to put something else in an area where there was rock. We checked our local on-line classifieds for free rocks, and found way more free available than we could ever use. 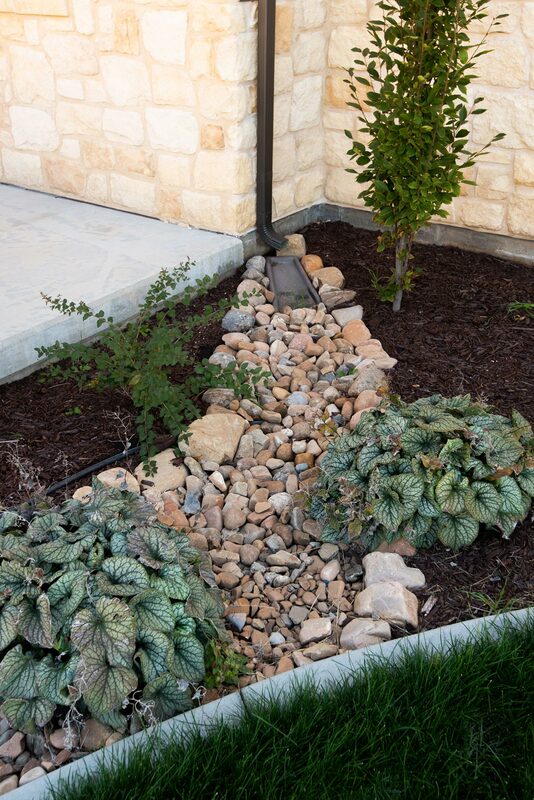 This is one of several dry stream beds we placed to help draw water from gutters away from our house. The rocks were free, acquired from a nearby yard that was once a dumping ground for building materials. The owners were so happy to have us take the rocks that they actually helped us gather them up. It was a win for both us and them. The main downside of rocks is the weight. Can’t help you there, but the good news is that at least you don’t have to dig a hole to plant them, and the pain is a one-time shot, unlike getting your water bill for keeping plants alive. Rocks also can help keep down weeds. Our basic method is to hoe out a little trough in the shape of the area where we want to put a rock scape and then line it with weed barrier before arranging the rocks. Depending on the type of rocks you use, the sky’s the limit on creativity. Drought-tolerant plants can be used as accents among the rocks. Rocks are a good option in not just drought areas, but hot sunny areas where many plants won’t grow well or in low areas where water collects. Rock gardens are used in a variety of cultures, from Victorian homes in England to gardens in dry California and New Mexico to zen gardens in Japan. A dry stream bed in Santa Fe, New Mexico. 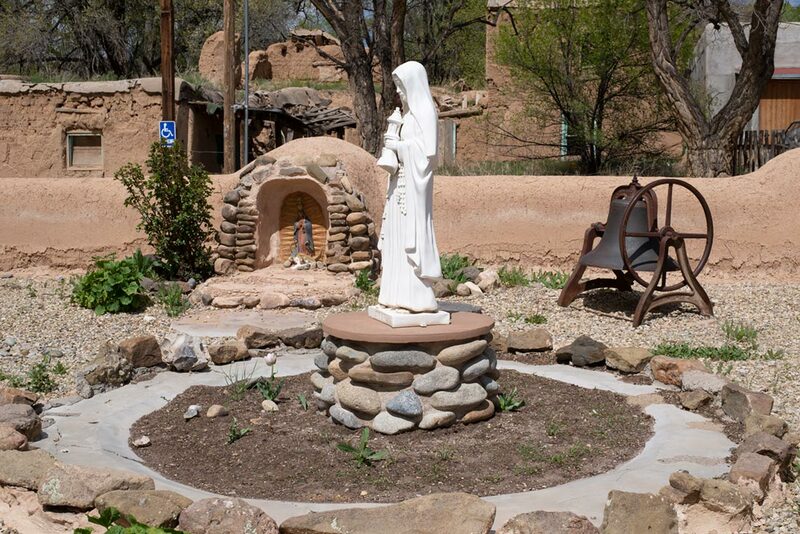 In very arid locations such as Taos, New Mexico, where this churchyard is located, rocks can even take center stage. Many of the most famous memorials are a form of rock garden, such as the Vietnam Memorial's polished black V shape, and the Rockery, a Civil War monument in Easton, Massachusetts. 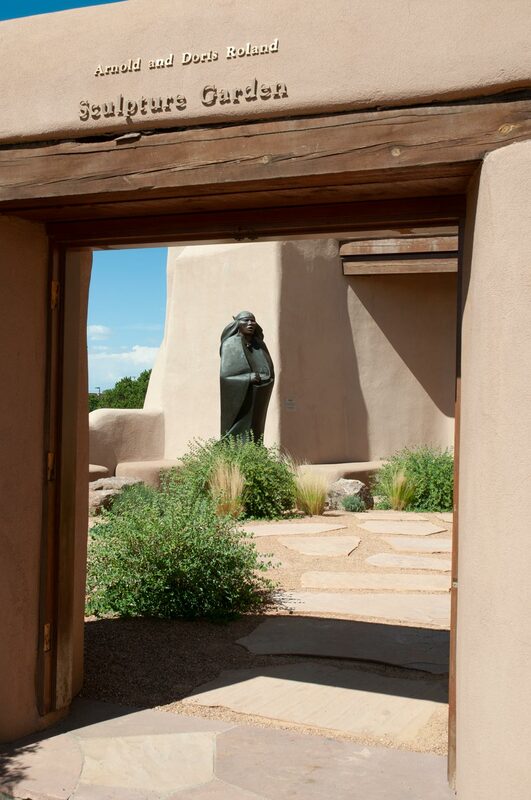 This sculpture garden in Santa Fe, New Mexico is mostly rocks, with only a few plants. The most famous rock gardens are Japanese. Indeed, their aesthetic of nature and austerity forms the foundation of Japanese design. Called zen gardens in English and karesansui or “dry mountain and water” in Japan, rock gardens are used to create miniature landscapes by carefully composing arrangements of rocks, a few pruned trees and bushes and gravel or sand that is raked to represent water ripples or to show the flow of water downhill. Zen gardens are ideal for small areas such as a patch of land by a door or patio. They are made to be seen from a particular viewpoint. In a culture that deeply appreciates nature as a part of spirituality, zen gardens are places for meditation and enlightenment. They have been built in Japan since the Heian period (794-1185), when they were copied from Chinese landscape paintings. The rocks can be symbolic, with a group of rocks representing a legendary Chinese island home of Eight Immortals which the Japanese call Horai and the Chinese call Penglai. The rocks are placed to look like natural landscape elements, with few or no plants among them. Some look like islands in an ocean, with white gravel raked into ripples to represent the sea around the islands. The white gravel is a distinctly Japanese feature that symbolized purity in the Shinto religion. 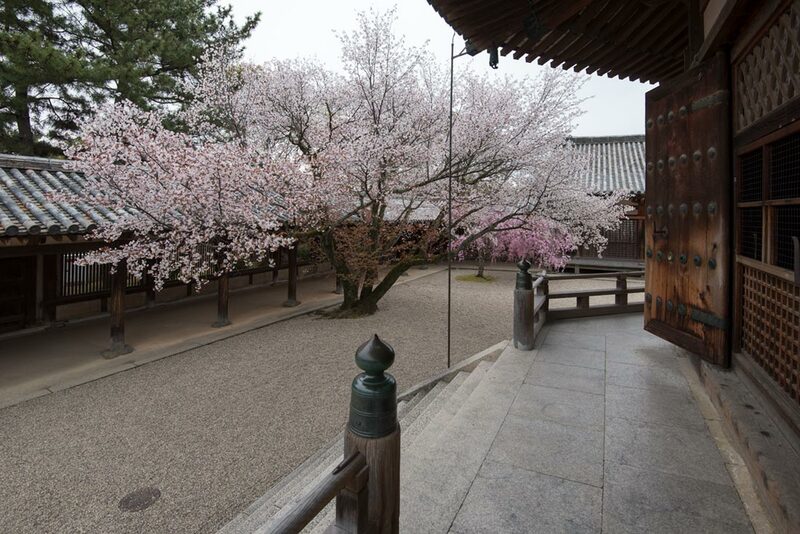 It also is used widely in the courtyards of shrines, temples and palaces to represent emptiness and distance. During Japan’s Muromachi Period (1336-1573), the zen garden was developed. An outgrowth of the introduction of Zen Buddhism into Japan at the end of the 12th century, it was popular among the Samurai warriors and warlords. It wasn’t until the 14th and 15th centuries that the art form developed into the austere, minimalist style of today’s zen gardens. The first garden in this style was built at a temple in Kyoto called Saihō-ji. The temple’s lower garden was a traditional one around a pond, while the upper garden was a dry rock garden featuring three rock islands. The most famous zen garden is Ryōan-ji in Kyoto, a rectangle of 340 square meters with 15 stones composed in five groups and surrounded by gravel which monks rake daily (see the photo at the top of the page). It is viewed from a seated position on the nearby veranda of the monastery abbot’s residence. In the 20th and 21st centuries, the zen garden style has become popular outside Japan. This zen garden is part of the Portland Japanese Garden in Portland, Oregon. The rocks are placed to be symbolic of a master monk's disciples turned toward the master, represented by the tall rock at the right. The raked gravel represents waves of water. Zen gardens are miniature landscapes designed to represent an ocean scene with islands that look like this scene along the Oregon coat. The idea is that viewing such a garden is like going on a journey through life. 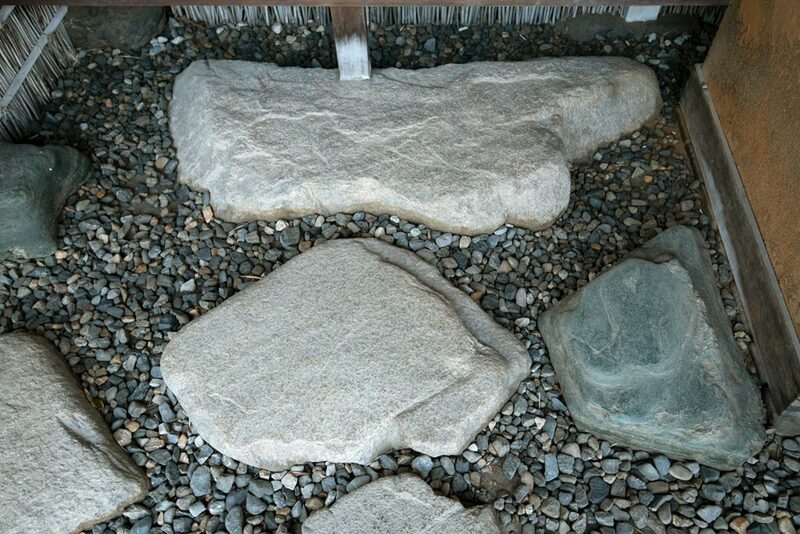 In placing stones in Japanese gardens, rugged ones with sharp edges are used to create miniature mountains while smooth rounded ones are used for the beds of gravel streams and beaches, to mimic the use of rocks in nature. More horizontal stones are used than vertical ones and they are rarely placed in straight lines or symmetrically. Usually one or more groups of three large rocks are used. A tall vertical rock with two smaller rocks on its sides are representative of Buddha and his two attendants. Sometimes a tall vertical rock is used with a reclining one, or a short vertical one with a flat one. Rocks are used that are different colors, shapes and sizes, bright colors are not used, and the grains of rocks all run in the same direction. These rocks in the Imperial Palace gardens in Tokyo, Japan, have striations that look like a waterfall coursing down cliffs. The dark rocks at their feet represent water. We used this photo as a model in locating striated rocks for our own dry waterfall (see photo of our patio and dry waterfall above), placing the rocks so that the striations were vertical to suggest a waterfall. 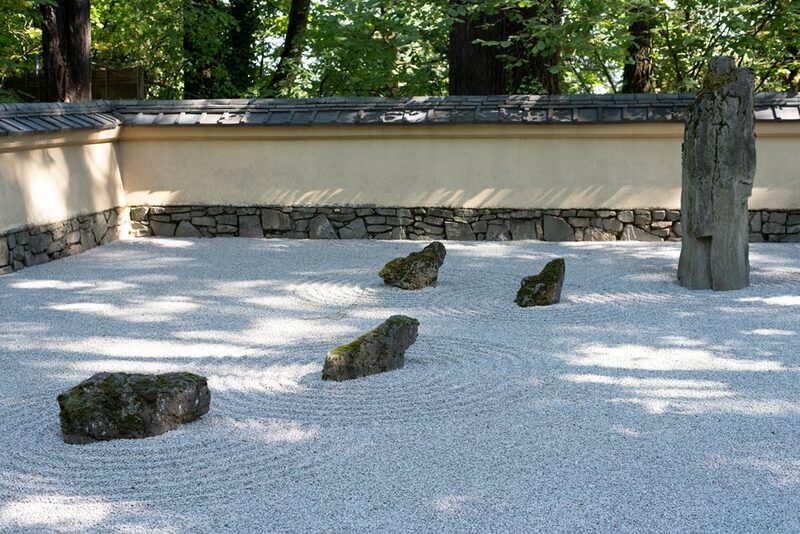 Gravel, not sand, is used in zen gardens because it is not disturbed by rain and wind. When the sand is in a garden that is viewed but not walked on, Zen priests rake the gravel into waves as practice in learning to concentrate. However, many Japanese gardens also have gravel-covered courtyards with a few signature plants. A gravel courtyard at Horyu-ji Temple, Nara, Japan. 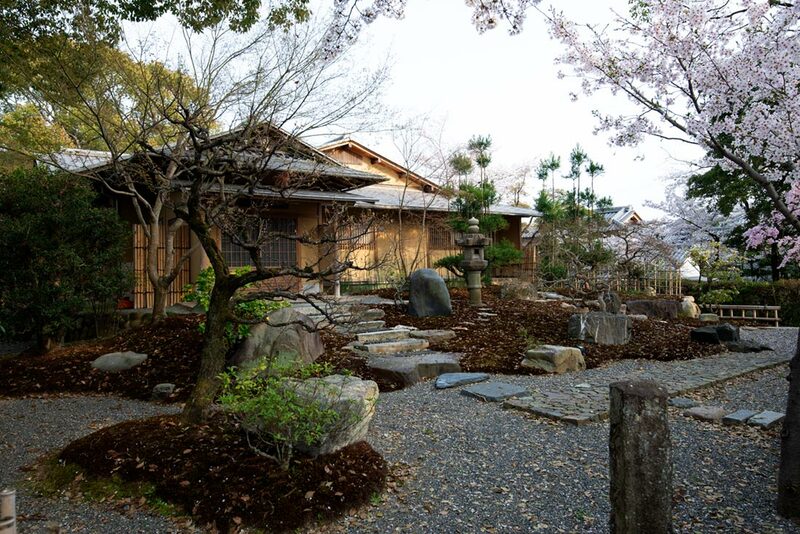 This scene at Horyu-ji temple is typical of the spare use of plants and rocks in the yard of a Japanese cottage. 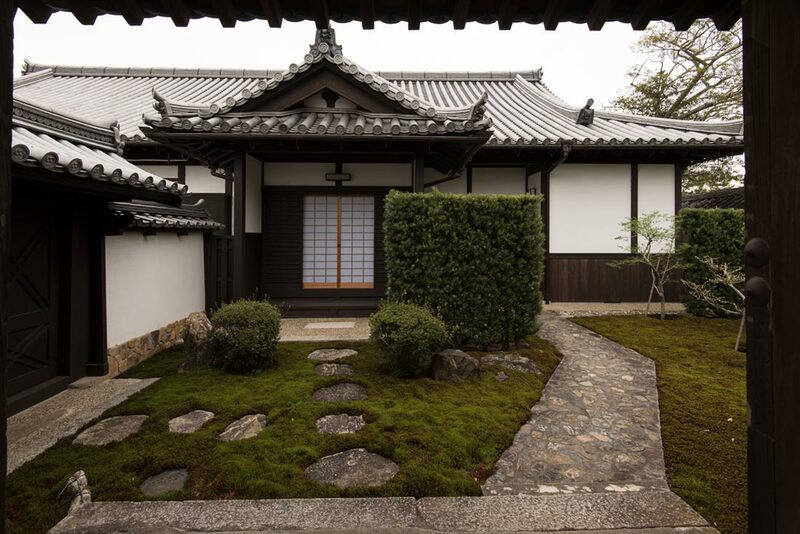 The front yard of this cottage in Kyoto, Japan, is landscaped in the same style. Despite its spare use of plants, it looks like it is located in the woods rather than its true location in a busy city. Rock landscaping doesn't have to be extensive. 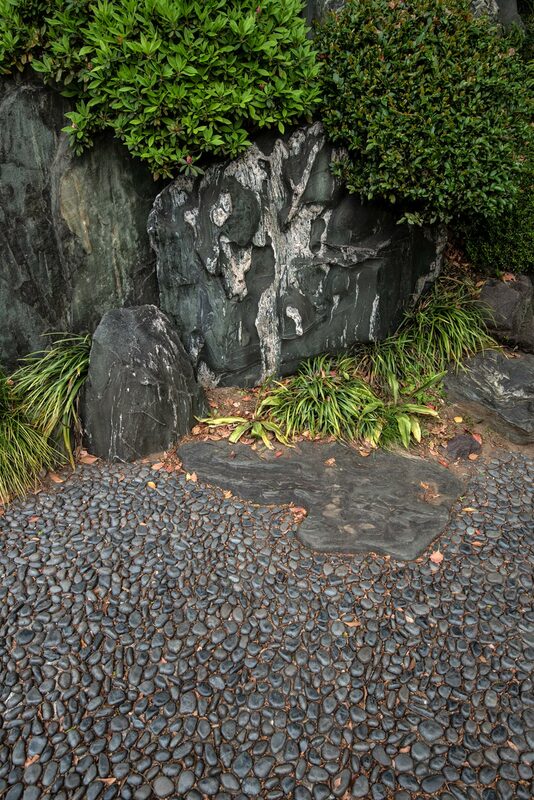 Here, a few stones and pebbles add charm to a small patch next to a building at Katsura Villa in Kyoto, Japan. Donna Rouviere Anderson and Forrest Anderson are working on a photo-illustrated book on Japanese design.